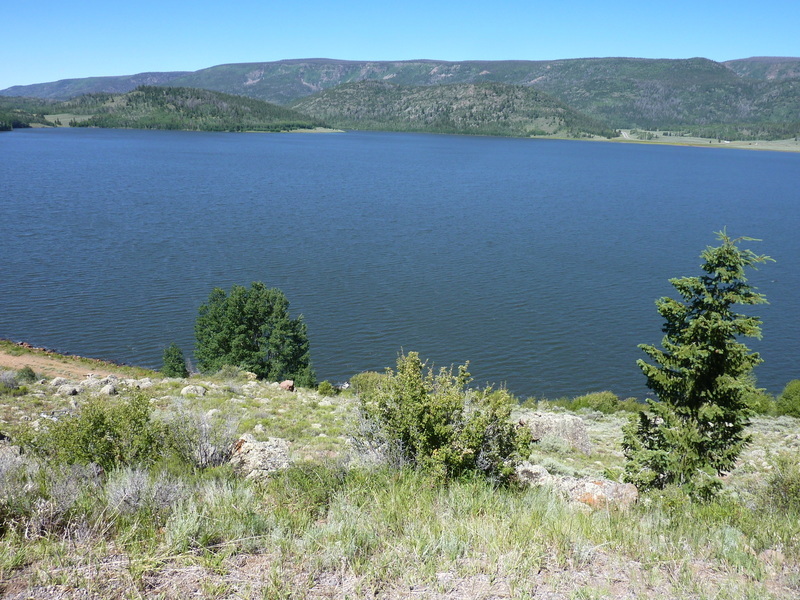 Fish Lake Hightop is the highpoint of Sevier County, UT with more than 4,000ft of prominence. At its base lies Fish Lake, the largest natural mountain lake in the state from which the surrounding Fishlake National Forest derives its name. The county highpoint is not altogether very difficult to reach - about 10mi roundtrip with less than 3,000ft of gain, starting from the pavement near Fish Lake. For those interested in a much shorter excursion and access to a beefier vehicle, there is a backcountry jeep trail that reaches a high TH a mere 10min from the summit. I used the lower Pelican Canyon Trail starting from the Pelican overlook (about 15min from Fish Lake by foot, or driveable with high clearance). The trail leads away from the lake and into a nice mix of aspen forest and meadow before picking up an old roadbed that begins the 2,000-foot climb up Pelican Canyon. Views are absent for much of this hike but the real beauty begins when you top out onto the Fish Lake Hightop Plateau, a boulder-strewn mesa with alpine grasses and flowers that extends for nearly five miles. Ducks lead across the plateau where the trail is thin, leading you to the 4WD trailhead located just below the summit. A short scramble leads to the highpoint above the plateau, offering views in all directions. A benchmark and register are found among the summit rocks along with the teetering remains of a wooden survey tower. The register shows a good many visitors, dating back only as far as 2009. Among these were a few of the usual CA suspects including Richard Carey and Terry Flood, both from the San Diego area. I spent a little over two hours in reaching the summit and perhaps a half hour less time in descending back to the start.